This staged quest has you looking for Cacti, ammo boxes and more to get your Battle Star. One of the challenges this week involves using finding certain items around the Fortnite map. You’ll need to find and destroy 30 Cacti in the Desert, ammo boxes in the Snowdome and Chests in the jungle, so here’s what you need to do to complete the challenge and get that Battle Star. This challenge is quite straightforward. Head to Paradise Palms and destroy 30 Cacti for the first stage of this challenge. Keep an eye out for other players because it’s about to get busy. For the next stage, head to the Snow biome and search ammo boxes. You’ll find a lot of ammo boxes at Frosty Flights and the Viking Village but again beware of other players. Expedition Outposts also have a lot of ammo boxes in them or nearby, so search there too! Finally, you need to search chests in the jungle. Head for the volcano and Aztec temples as there are loads of chests nearby to search. Lazy Lagoon is another good spot to try. This challenge is a great opportunity to use the new Party Assist function so you and a pal can complete this challenge faster. 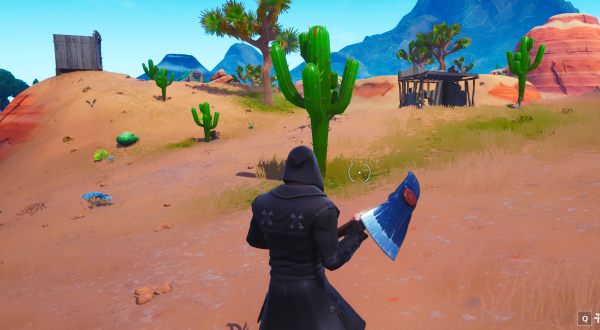 The post Fortnite: destroy Cacti in the Desert appeared first on VG247.